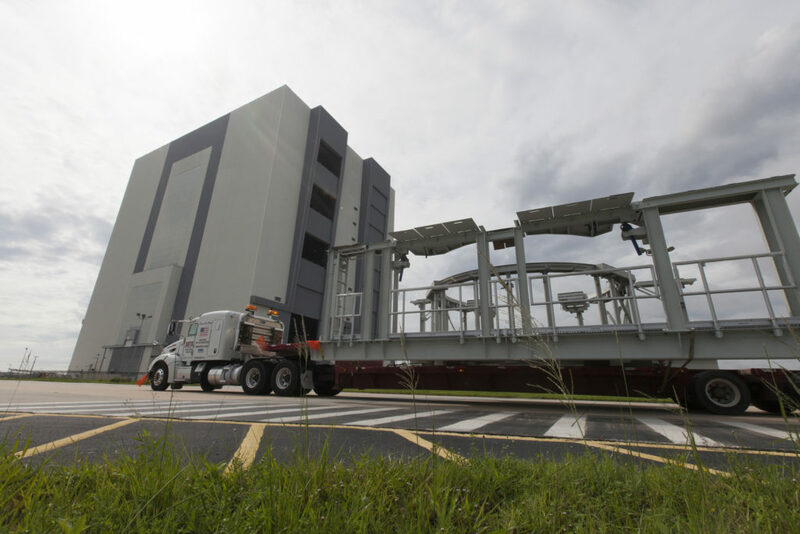 New service platforms for NASA’s Space Launch System (SLS) booster engines arrived at the agency’s Kennedy Space Center in Florida. The platforms were transported on two flatbed trucks from fabricator Met-Con Inc. in Cocoa, Florida. They were offloaded and stored inside the Vehicle Assembly Building (VAB). The platforms will be used for processing and checkout of the engines for the SLS’ twin five-segment solid rocket boosters for Exploration Mission-1 (EM-1). The boosters, in combination with the rocket’s four RS-25 engines, will produce more than 8 million pounds of thrust at liftoff. The first SLS mission, EM-1, will launch an uncrewed Orion spacecraft to a stable orbit beyond the Moon and bring it back to Earth for a splashdown in the Pacific Ocean. The mission will demonstrate the integrated system performance of the rocket, Orion spacecraft and ground support teams prior to a crewed flight.